A vintage velvet loveseat. The old cuckoo clock that hung in your grandmother’s kitchen. A flowery needlepoint sampler that hangs on the wall. What do these items have in common? 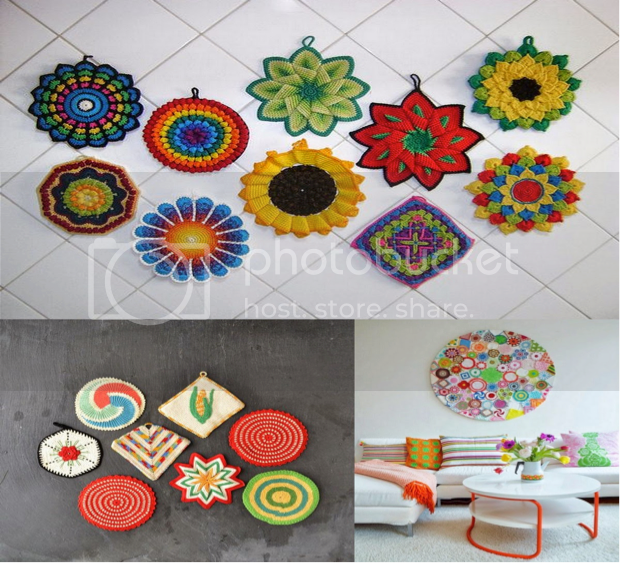 They are all trademarks of the hottest style of decorating your home, Granny Chic (GC)! What exactly is Granny Chic style? The heart of GC style is combining vintage and modern elements that pay homage to history while also breathing new life into traditional pieces. 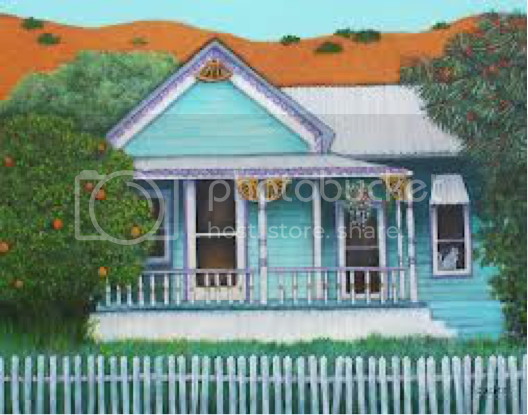 It evokes a sense of nostalgia and comfort, like that warm, fuzzy feeling you got when you visited your grandmother’s house. For example, the old-fashioned dark wooden cuckoo clock I mentioned earlier can be updated by painting it in a bright new hue, instantly transforming an otherwise cliché accessory into something modern, desirable and adorable. By combining furniture, accessories and unique color palettes, you too can create your own distinctive interpretation of Granny Chic style. The GC style is not only fashionable, it is also responsible and eco-conscious. With so many of us taking an active interest in things we can do to help conserve resources on our planet, the GC style is a great way to turn something old into something new again- and perhaps even better than before! Since furniture pieces are usually what anchor a room’s style and feel, this is a great place to start putting together your Granny Chic space. Vintage velvet sofas, traditional style upholstered dining chairs and old wood side tables are great pieces to look for to start your collection. The great thing about GC style is that you don’t have to necessarily makeover any of the old pieces- you can update them simply by adding either modern or GC vintage accessories such as a granny square blanket to a modern couch along with a few needlepoint pillows. If you are more of a creative type, the GC style offers plenty of opportunities to inject your imagination. 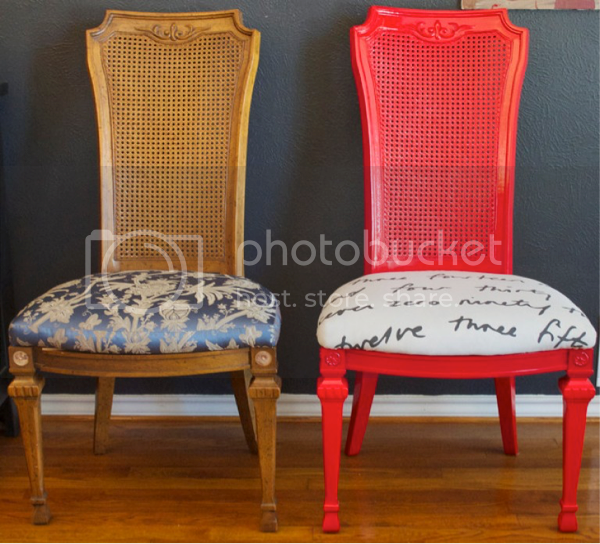 As shown in the before and after photo above, the traditional dining chair is given an updated, modern new look with the addition of a coat of bright red paint and a black and white print fabric. See how the after piece totally pops? The made-over chair is much more interesting than the “before” chair and can now stand on it’s own not only in a dining room, but also as a unique accent piece in a living room or bedroom. Where furniture may be the starting point of a GC inspired room, accessories are what can really make a room take off, and the plethora of GC-style options make it easy to transform your space. Handmade items of all kinds- blankets, needlepoint samplers and crocheted items, old clocks, and brass candlesticks are just the tip of the decorating iceberg when it comes to GC. In a kitchen these items can include vintage appliances such as mixers or toasters, dainty lace café curtains and even salt and pepper shaker collections. Collections themselves offer up a great opportunity to be showcased, such as vintage china plates hanging on the wall, or a collection of vintage cookie jars displayed on shelves. It’s about taking the things you love and showcasing them- elevating them from simple knick-knacks to beloved treasures. As every decorator knows, color is the best way to add life and interest to a room. As for GC style, the sky is the limit when it comes to color! The mixing of color and patterns is a touchstone of GC decorating, and whether its bold pops or subtle pastels, there are a few helpful tips you can follow to create a cohesive, well-curated look. 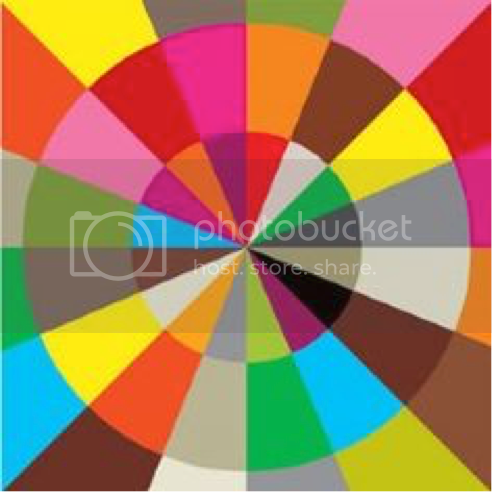 To help get you started and prevent you from being overwhelmed, pick three colors- two main colors and an accent color that adds either subtlety or vibrancy. You can choose these three colors from an accessory such as a blanket, rug or painting, then pick additional accessories that stay within your color parameters. When looking for color inspiration, look to the past! Bright turquoise, coral, mint green, and buttery yellow are all great inspirations to build your GC color palette from. Think of vintage Kitchen Aid mixer colors or other retro items such as old refrigerators, accessories and prints. These colors do not only invoke a retro vibe to your space, they also add vibrancy, liveliness and coziness. Just like Grandmas house used to! Just like Grandmas house made you feel welcomed and comforted, the main objective in GC decorating is to create a homey, cozy and relaxing space. After reading about the fun and unique ways you can turn your own space into a GC space, you may be wondering where the best place is to find such items. Why, it’s at estate sales, of course! From furniture to kitchen items to other vintage granny treasures, estate sales are an economical and fun way to create your own personal GC style. The next time you head out to an estate sale near you, keep these ideas in mind to help you find your own granny-chic treasures!